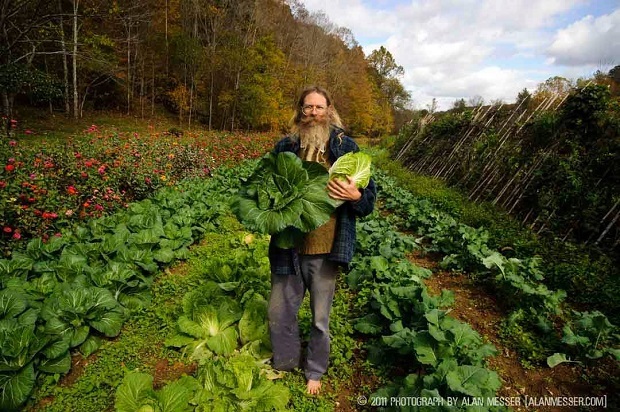 Jeff Poppen, known as the “Barefoot Farmer” and the owner and operator of Long Hungry Creek Farm has been farming for the last 40 years in Red Boiling Springs, Tennessee. Long Hungry Creek is one of the oldest and largest organic farms in Tennessee; but Poppen’s farming goes beyond organic by using biodynamic farming methods, concepts developed by philosopher Rudolph Steiner in the 1920’s. When asked to reflect on how the farming world has changed over the last 40 years, Poppen points to economic changes brought on by the artificial synthesis of nitrogen in 1914. “The real problems with agriculture began during WWI. The same things we use to make gunpowder were repurposed to make herbicides and pesticides. We began to artificially synthesize nitrogen, which made the separation of vegetable and animal production possible.” Before then, he notes, even the USDA preached universal integration of plant and animal crops. Since then, the separation of those fields, especially in an educational setting, has become a huge issue when it comes to sustainable production. “Domestication of animals and civilization go hand-in-hand because animals make land fertile. There are many ways to close the nutrient cycle, and that knowledge is deep inside of us.” Instead of using traditional methods that Poppen references all the way back to quotes from the Bible, we’ve fallen back on these “easy” alternatives we’ve created without thinking about the environmental implications. The Organic Growers’ School has the honor of hosting a Pre-Conference Workshop at UNCA taught by Jeff Poppen on March 11th from 9:30 – 4:30 p.m. covering The Principles of Biodynamics. Registration for Jeff Poppen’s workshop at the Spring Conference is now closed. Consider attending the 2nd part of this workshop on July 9-10 at Living Web Farms.